Happy is good. But holy is better. Your marriage is more than a sacred covenant with another person. It is a spiritual discipline designed to help you know God better, trust him more fully, and love him more deeply. What if God's primary intent for your marriage isn't to make you happy ... but holy? 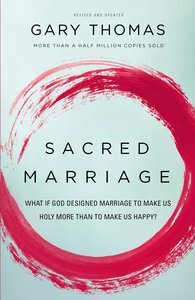 Customer Reviews For "Sacred Marriage"
This is one of the greatest Christian books on marriage. Many people, including Christians often enter marriage in order to seek happiness, only to be disappointed because it's only God that can satisfy their hearts. This book offers a different perspective on marriage, that is God designed marriage to make us more holy than more happy, which will create a stronger foundation for our marriages. The author is faithful to the text, and provides application that is based on the text. Overall, a great marriage book for those entering marriage or married couples.